From the colours you wear to what style of clothes to avoid, there seems to be a wealth of do's and don’ts out there. 1. Go Monochrome : Wearing a single colour from head to toe can help create an elongated silhouette, giving the illusion of height. Too many different colours can break up your silhouette, creating a blocky appearance. 2. SAY HI TO HEELS : One of the most obvious and embraced fashion tips for short girls is to wear heeled shoes. Whether you’re after a bit of a lift or added inches, a pair of heeled shoes will physically give you extra height. If you’re not used to teetering around in stilettos, why not try a ‘safer’ option like a wedge shoe? High Heels "A Good Idea"
3. WEAR HIGH WAISTED STYLES : Creating the appearance of being taller is all about proportions. Wearing high waisted shorts, pants or skirts creates a kind of optical illusion. The higher waist leads to the appearance of longer legs and thus a more willowy silhouette. 4. 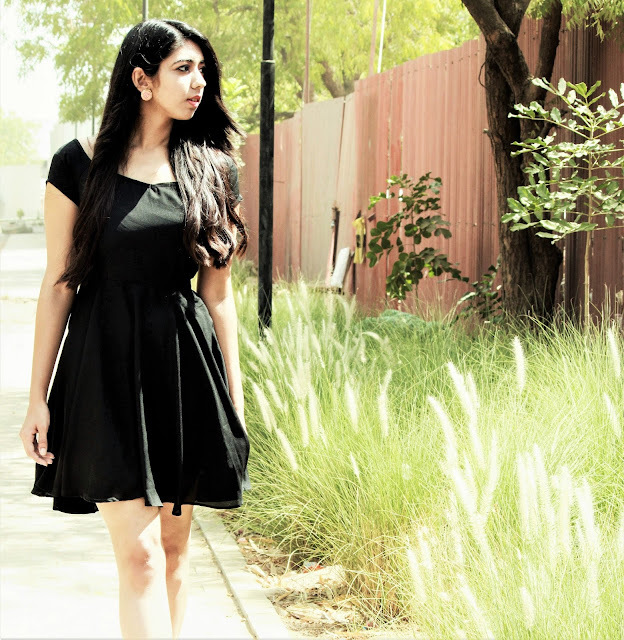 SHOW OFF SHORTER HEMS : Mini skirts and dresses are great if you have the legs for it. 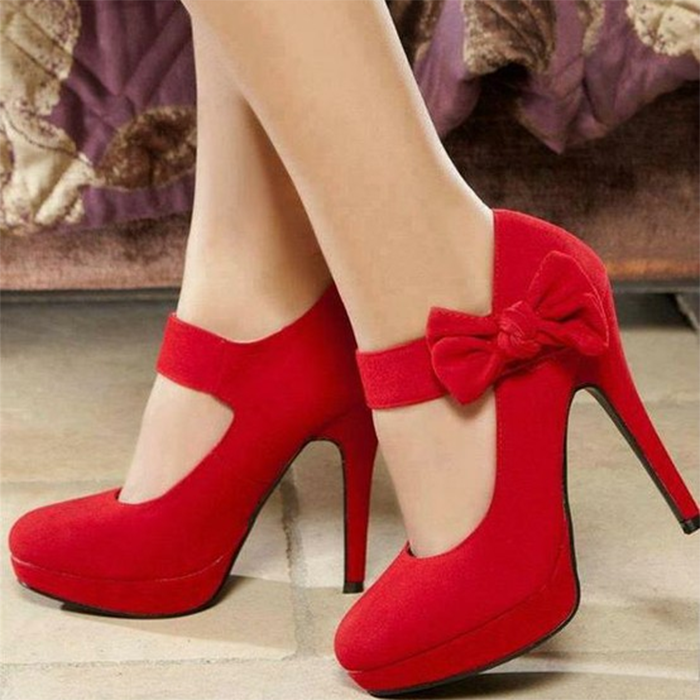 Combined with the right choice of shoe, they can create the appearance of long, lean legs. 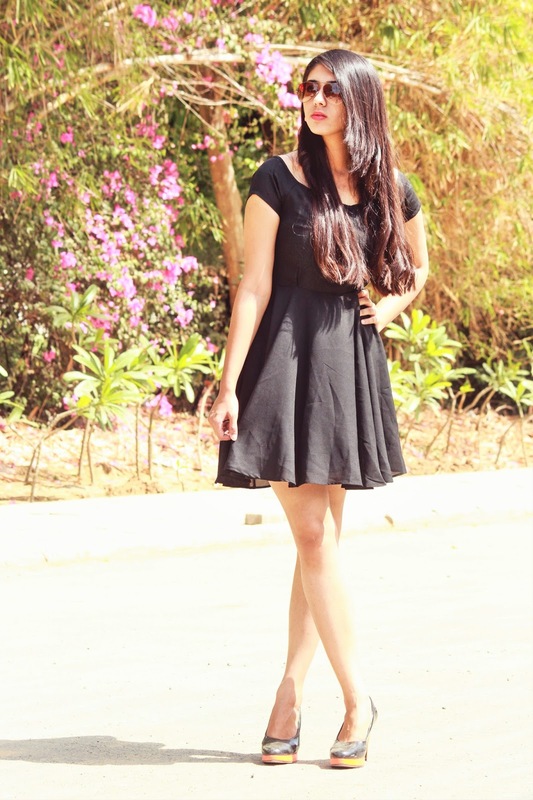 However, skirts and dresses that finish just above the knee are a safer bet for most short girls. 5. CHOOSE THIN BELTS : When it comes to fashion tips for short girls, belts can be dangerous territory. Using a belt to cinch in a dress or top can effectively cut your body in half and hamper efforts of creating an elongated silhouette. As a general rule, however, stick to slimmer belts as they are better proportioned. I have been a city girl for as long as I can remember. There is something truly beguiling about the way the thrilling hustle and accelerated pace pushes you to move further. Having said that, however, once in a while its imperative to find serenity in what you do and entangle from the daily convolutions that seem to tag along. That's the vibe I sought to create in this post. Off-shoulders have created quite a buzz for a while now and they're here to stay for the long haul, the trend not disappearing anytime soon. Being a component of the 'Blogger of the Month' series, this particular black off-shoulder from Oranje's collection had me falling for it before it even arrived. 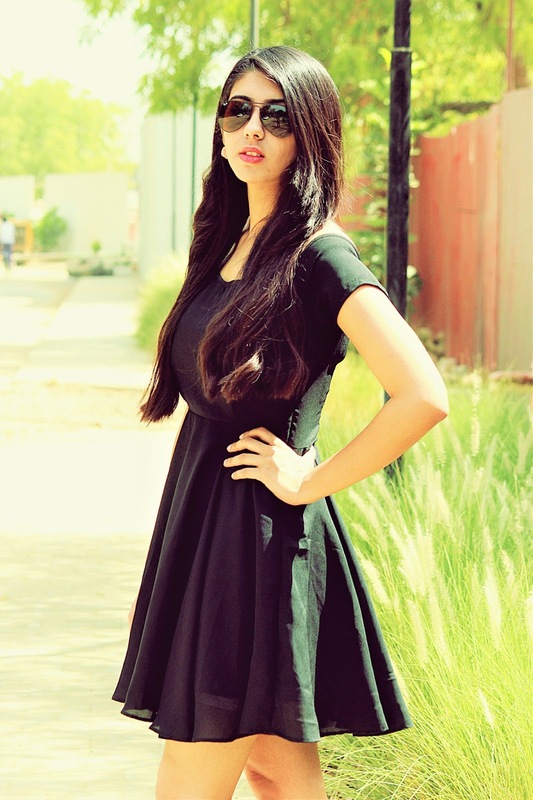 More often than not, we experience those days before a big night where we'd opt for a rather chic find of a dress, black being the palette most of the times.This off-shoulder dress is unquestionably ideal for such events that call for sudden occasions that require a pinch of sophistication. The whole flounce finish of the dress acted as double brownie points, enough to make you happily twirl in it. I amped up the outfit with statement pumps and rose studs to bring about a chic facet to the look. Let me know in the comments below how you liked this look and I shall see you soon with a new post. The charm of this month is enough to allure any fashion enthusiast into its entwined web, enough to announce me as Blogger of the Month for Oranje Clothing. It's always amazing when your work is appreciated enough to lead to the next level, and it gets all the more better when it's coming from a brand symbolizing the power of femininity. I have an unbounded love for all things summer(as I have mentioned many times before); and florals form an indispensable part of it. When it comes to warmer days, most of us resort to the unfailing floral print and there is absolutely no going wrong with them. That being one of the major reasons that made me choose this particular outfit for the series. With this look in mind, I wanted to bring out the feminine and delicate element of the dress. I love intricate details and the lace section was my undoing. However, the most striking aspect of the outfit has to be the floral design, which was further enhanced when camouflaged with the background. It's great for those brunch dates out when you want to look your girly best and still retain that bit of crisp dressing. This being just the start of the series, there's a lot more in store for the month. Let me know how you liked this look and what's your idea for a girls day out look? The good — and sometimes frustrating thing — about working in fashion is the fact that you're constantly surrounded by really well-dressed women. It can be awe-inspiring and downright infuriating, but that's the truth. As such, I've spent a lot of my time in the industry studying their looks and, well, just asking a lot of questions about their outfits and their sense of style. The conversations over the years have led to one fundamental truth. It doesn't matter the age of the woman, what she does, or even how much money she has to spend on her wardrobe. The most stylish women in the room have one thing in common: they always stay true to their personal style. It sounds simple, but your personal style is what distinguishes the best dressed women in the room from everyone else. It's not the trends and not the expensive handbag they're carrying, but how the outfit highlights the woman who's wearing it. These women have a keen sense of what looks good on their body types, what colors highlight their complexion, what shoes are cool but also practical, and what look best suits the occasion. They're thoughtfully in tune with their fashion sense daily, and that strong sense of idenity guides them when they're choosing an outfit for everything from a weekend getaway to a high-stakes business dinner. If it sounds out of reach, it doesn't have to be. There are simple steps you can take regularly to help tune into your own fashion sense and build your own perfect wardrobe. Take stock of your wardrobe while paying attention to the pieces that are worn the most and the pieces that still have the tags on. Are there big gaps in your closet? Essentials you're missing or need to be refreshed, like the jeans you've worn to death or the little black dress you keep telling yourself to buy but keep forgetting? Make a list of the items you need to buy or replace while removing the pieces you haven't worn and placing them in piles for donation or consignment. Just the act of taking inventory will give you a more concrete idea of what your style looks like and what areas you need to invest in (or maybe stop buying) for a more complete wardrobe. Dressing for yourself also means dressing for the body you have. Sure, we have insecurities and not every trend is meant to celebrate every body type. But don't get bogged down in the stuff you can't wear and don't try to make it work if you know in your heart that it just doesn't — or worse, makes you uncomfortable. Focus on the assets you want to highlight and let that become your signature. Dress an hourglass shape with a waist-cinching full skirt or show off your stems with slim-cut denim. These pieces will show off your shape and define your style. Being dressed for the occasion is just as important as dressing for your body type. Think about how funny it looks when you wear clothes are that noticably big or too small; being inappropriately dressed is just as noticeable. Remember who and what the occasion is about, and let that guide the dress code. If it's casual without too much restriction, focus on the pieces you feel really great in and keep fit and condition of the garments top of mind, i.e. avoid anything too tight or too baggy and watch for holes, stains, etc. If all else fails, wearing something clean that fits well is always a win. It's tempting to live by the trends, especially since they're more accessible than ever. But iconic style isn't built on blindly following what's in and what's out. Stick to what you know about yourself (revisit your closet inventory if you have to), your body type, and your lifestyle, and remember that what works on the pages of a magazine or on a runway doesn't always translate — and that's perfectly OK. Find the trends that align with what you already love and incorporate them in small ways with the classics you already have. If there's a single action item to take from this list and start tomorrow, it's this. I've often wondered how the best dressed style insiders and bloggers survive a month traveling for Fashion Week and still manage to look so chic. The secret isn't that complicated: they plan for it. They lay out their outfits and photograph them before their trip, knowing exactly what goes with what when they unpack their suitcases. The more realistic version of this is to lay out your outfit the night before. Think about where you're going and what the weather will be, and let that guide you. Not only will you have time to be thoughtful about your outfit choices, but you'll also save yourself from the panic that ensues when you realize the blouse you threw on has a massive stain on it. A little advanced planning helps you present your best outfit. The fact is great style doesn't just happen. It's the result of well-stocked wardrobe and a woman who really knows herself — but you don't have to be a fashion blogger to get it. Just start simply with these everyday rituals and make everyone else wonder how you do it.